In Photoshop Elements, you can use the Photo Filter command to apply photo filters to your images, adding special effects. In the old days, photographers used to place colored glass filters in front of their camera lenses to adjust the color temperature of the light. They did this to either warm up or cool down photos, or to just add a hint of color for subtle special effects. Light has its own color temperature. A photo shot in a higher color temperature of light makes an image blue. Conversely, an image shot in a lower color temperature makes a photo yellow. In Edit Full or Edit Quick mode, choose Filter→Adjustments→Photo Filter. The Photo Filter dialog box appears. Note that you can also apply the photo filter to an individual layer by creating a photo-filter adjustment layer. Add filters to images with the Photo Filter dialog box. In the dialog box, select Filter to choose a preset filter from the drop-down menu, or select Color to select your own filter color from the Color Picker. 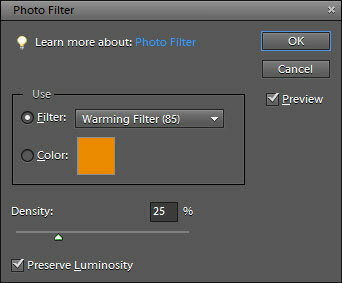 Warming Filter (85), (81), and (LBA): Adjust the white balance in an image to make the colors warmer, or more yellow. Filter (81) is like (85) and (LBA), but it’s best used for minor adjustments. Cooling Filter (80), (82), and (LBB): Also adjust the white balance that’s shown, but instead of making the colors warmer, they make the colors cooler, or bluer. Filter (82) is like (80) and (LBB), but it’s designed for slight adjustments. Red, Orange, Yellow, and so on: The various color filters adjust the hue, or color, of a photo. Choose a color filter to try to eliminate a colorcast or to apply a special effect. Adjust the Density option to specify the amount of color applied to your image. Select the Preserve Luminosity option to prevent the photo filter from darkening your image. Click OK to apply your filter and close the dialog box. One way to minimize the need for color adjustments is to be sure you set your camera’s white balance for your existing lighting conditions before shooting your photo.